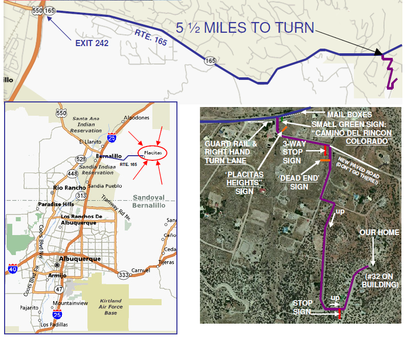 To get to the start of the race, go north on I-25 and get off at exit 242 (the northern of the two Bernalillo exits). Go east (right) toward the mountains. This is Route 165. Go east about 5.5 miles, and on the right look for a guardrail, some mailboxes, and a small turning lane onto Camino del Rincon Colorado. ​There will be some kind of sign indicating the race. Follow the signs to Camino a las Estrellas (#32). You can call us at 554-2337 at any point when you are lost. The February handicap was held in Placitas on a beautiful, warm Saturday. A few of us that had been around for several of the annual Placitas handicaps were reminiscing about one of times we had temperatures in the teens and a driving wind. And about 25 people showed up! There are always 3 guarantees with this run – 1) the course will be extra hilly, 2) there will be wonderful food, and 3) the weather will be unpredictable. Luckily for those of standing outside to time and cheer on the runners the weather decided to go the “unseasonably warm” route this year. In years past this has been a prediction run but this year we decided to do things a little differently. Keeping with the couples them of prediction runs past, we paired people up at random after finishing and the team with the combined lowest finishing place was the winner. That team turned out to be Joyce and Martin who finished first and third overall, making it impossible for any other team to beat them. Congrats to both of them on strong runs and the luck of the draw! While some things change, others the stay the same and so it was with this run. As in recent years, this was the eat and run biathlon so after all of the runners finished the grueling 3.5 mile course, we all enjoyed a wonderful potluck. Thank you very much to our wonderful hosts, the Wilsons, for opening up their homes to all of us and for once again reminding us of the beautiful trails that Placitas has to offer. Looking ahead, we’re getting ready to wrap up our last two handicaps of this series. The March handicap will be held on Sunday, March 20 at 8:30am and the last handicap of the series will be on Saturday, April 2nd at 8:30am. Please check the website for course descriptions and locations. We have a very close race right now for the series prize of free shoes. 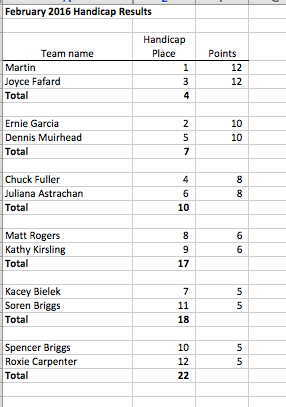 Spencer Briggs is in the lead but has several people right on his heels. Come join us for these great events and let’s see who will get this season’s prize!